Ghost stories have a long history in Japan. But zombies have not really made much impact in modern Japanese culture. So far. There have been a few zombie manga and anime. Like Zombie-Loan and Highschool of the Dead. And Tokyo Zombie was a movie starring Tadanobu Asano and Show Aikawa. Tadanobu Asano is a very, very good actor. He was in Zatoichi with Beat Takeshi and he is in the new movie 47 Ronin with Keanu Reeves. 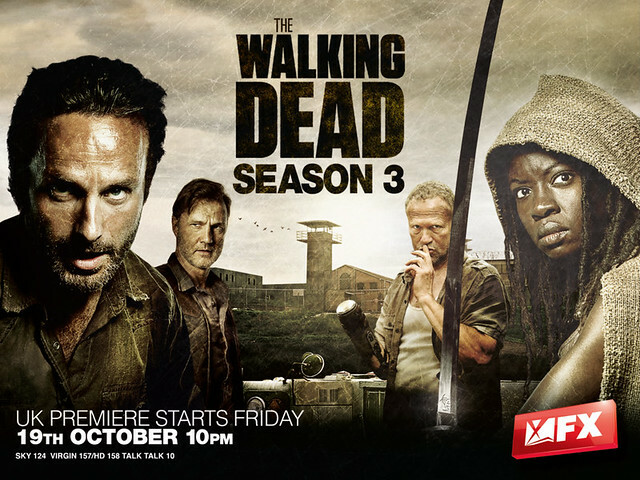 The cool zombie apocalypse TV series The Walking Dead is broadcast on cable TV in Japan. It is not as well known as it really should be. Michael Rooker plays Merle Dixon. It turns out that Michael Rooker trained in aikido. In his IMDB entry it says he studied aikido with Fumio Toyoda Shihan, an aikido and zen teacher. A book about combat techniques you can use against zombies must be aimed at the most fanatical zombie otaku. Or martial arts otaku. I wrote about otaku before here (or here on aikiweb). That post has a great photo. But in fact it's not difficult. The safest Japanese martial art to use against a zombie would be kyudo - Japanese archery. Of course. A bow and arrow would let you keep a healthy distance between yourself and a fatal zombie bite. The ma ai - the critical distance - of each martial art is different. Against zombies the bigger the gap the better. Which is why Daryl likes his crossbow. Then gradually that critical distance gets smaller and smaller. From halberd - naginata - to sojutsu - spear - to jukendo - rifle and bayonet - to kendo - sword. Michonne has her katana strapped to her back. Then finally unarmed martial arts. Karate probably has a safer distance than aikido and aikido has a safer distance than judo. I wouldn't recommend doing judo against a zombie. At a close grappling distance you might still get bitten in passing even if you throw cleanly. Although I remember a news report about a man successfully throwing an attacking bear with tomoe nage - a judo sacrifice throw. To the bear's surprise. But aikido's entering techniques are great for getting behind an attacker. Always a good place to be. So I'll be sticking with aikido. You never know. 3 Responses to "zombie aikido"
Thanks Graham. Just got to keep away from those jaws. Ha, ha. Nice blog. However I think you've pronbably trained with many zombies already. Peace.G.